Clear + Brilliant® is a powerful, yet gentle laser skin care treatment, clinically proven to fight the signs of aging. This treatment is designed to complement your existing beauty routine, much like the way you plan for a facial or trip to the hair salon. Aging and environmental factors can have a dulling effect on your skin. Clear + Brilliant® treatments address tone, texture and pore size appearance for noticeably smoother skin. Just one treatment can deliver these results, but routine treatments offer lasting results that can keep you looking younger for years to come. Developed by Solta Medical, the pioneers of FRAXEL fractional laser treatment, Clear + Brilliant® delivers laser-precise energy and smart-tip technology to brighten lackluster skin and restore its youthful glow. 92 percent of Clear + Brilliant® patients claimed their skin looked younger, felt smoother, and had a noticeable glow after a series of treatments. Typically used to treat the face, neck and chest, Clear + Brilliant® is a gentle laser that refreshes your skin from the inside out. The patented hand piece uses Intelligent Optical Tracking™ System (IOTS™) to ensure proper contact with your skin and provide uniform application to all treated areas. Tiny plastic bumps on the small roller attachment create millions of microscopic injuries to the upper layers of the skin. These micro-injuries force the skin to heal itself, boosting collagen production and replacing the damaged skin with clear, healthy skin. New skin (epithelium) will start to form within 24 hours but remains covered by the old superficial layer of the skin (stratum corneum). This process takes about four days during which time, the skin's natural exfoliation process will reveal the newly repaired skin tissue. Clear + Brilliant® procedures may be complementary to most other cosmetic procedures, like fillers or even Botox®. Clear+Brilliant® is a beneficial treatment for women and men of all ages and skin types, who want to be proactive in their skin care, addressing the early signs of aging or maintaining the look of their skin. Regardless of age, sun exposure, environmental conditions and lifestyle can contribute to lackluster skin. 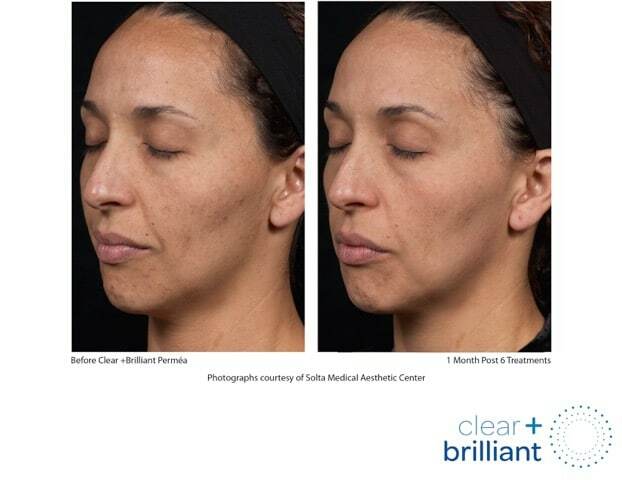 Clear+Brilliant® is also a great skincare option for those who don’t have the time for a more aggressive corrective laser procedure, but still want visible and lasting results. If you are looking for a more dramatic skin correction, other treatment options such as Fraxel® may be a better fit. Clear + Brilliant® is safe for all skin types but after a consultation, we can help you determine if this laser treatment is the right choice for you. During the consultation, we will pinpoint some of the key trouble spots Clear + Brilliant can help address. Clear + Brilliant® treatments take about 20 minutes or less. For maximum patient comfort, we apply a topical numbing cream to the treatment area. Once the skin is numb, we gently guide the hand piece across the target area and actively treat your skin. Clear + Brilliant can be done anywhere on the face, neck, chest and body. Immediately after the procedure, we provide a cooling agent. Patients sometimes experience mild redness and swelling that typically subsides within 6-12 hours. Over the next few days, patients may experience itchiness or skin sensitivity (to touch or temperature). Both are indications of the natural renewal process and usually dissipate within a few days. To ensure the natural rejuvenation process occurs, patients should avoid aggressive mechanical exfoliation and apply moisturizers and sunscreen frequently. The best part? Results are immediate and progress can last for months depending on the age and condition of your skin. The number of treatments is unique to your concerns and skincare goals. We usually recommend a series of 4-6 treatments although many patients choose to have routine treatments as part of their overall skin care regimen. What kind of results can you expect from Clear + Brilliant®?